This Saturday I thought I would provide us all with the opportunity for some exercise. Biking is the perfect group activity, a wonderful way to get some exercise, and a way to tour the city and not contribute to pollution by taking a tour bus. 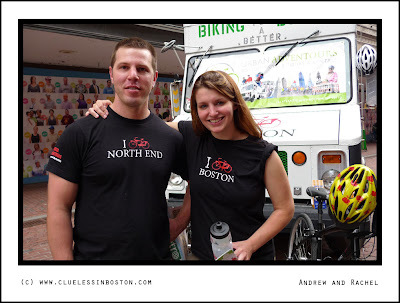 I met Andrew and Rachel at Downtown Crossing as they were publicizing Urban Adventours, which provides bicycle rentals, water, and most importantly, bicycle tours of Boston. Andrew is the "Chief Wheel Operator" of Urban Adventours located in the North End and would be the perfect guide for a bicycle tour. Biking is not something Boston is well known for, probably because of our narrow streets and the infamous Boston drivers, but biking is the perfect way for visitors to discover Boston or for locals to rediscover Boston. Your aubjecta look so wonderfully fit and healthy and the photo provides such excellent context. And bikers are also very friendly people. I don't think I have ever been turned down when I have asked a cyclist for a photo. Urban Adventures looks like a cool website. It's great fun meeting new people like this isn't it! I love the North End, but I've only explored it on foot. Which is a good pace because there's so much to see. But flying through the North End on a bike, hmmmm, it could be a thrilling experience in more ways than one. Beautyful portrait of a smart couple!Maybe it's easier to speak to people when they are not alone, or when they are doing something, not simply passing-by.I like the girl smiling and the boy serious just enough.. I'm not sure I'd like to discover a town with a bike. I'm a " walker-in-soul", as we say in France.To take care about mad cars drivers would be an empeachment to discover the town peacefully. I'd better use a bike in the country, on small roads. First of all I need to remmember how to ride a bike.I need to confess I'm not good with turns! Have a nice weekend in this wonderful city of Boston! Ever tried biking in Paris? I wonder how many skirts have been shortened! You are really good at portraits! I'm glad you started! I know your drivers well. I'll travel the scenic route on foot. What a fit looking couple...great shot. They exude happiness, energy, and confidence. By the way, thanks for visiting my shot of sunny Washington! I'd say these two look fit as a fiddle. And I agree, biking is a wonderful way to get around - tho in some areas, like ours, you need to be very careful. There is a sense of connection between Andrew and Rachel that you have captured. It's a great shot for capturing a magical moment that cannot be duplicated.